We’re wrapping up our 3-part series on why it makes sense to work directly with a content creator. In the first installment, we examined how the digital revolution upended the entire marketing ecosystem and, as a response, why many companies are bringing their marketing efforts in house and choosing to work directly with a content creator. The follow-up blog explored how working directly with a video producer has a huge impact on your bottom line. From less overhead, to faster turnaround times, partnering directly with a content specialist dramatically enhances your ROI. 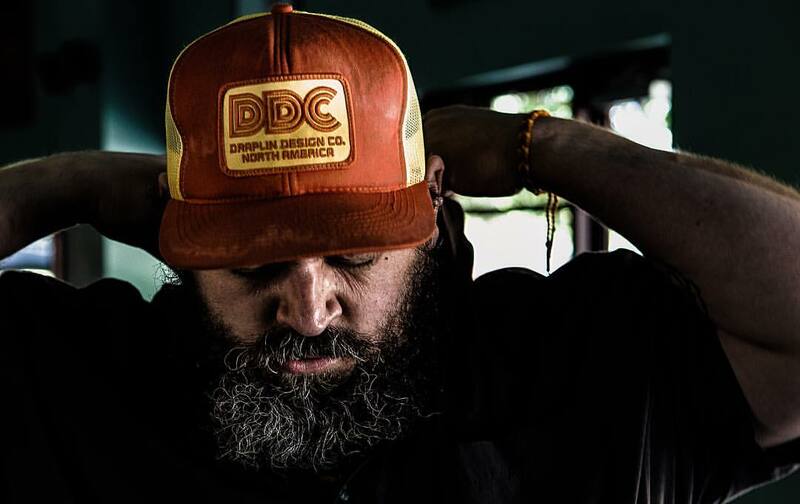 Aaron Draplin at Circles Conference 2016. He’s wearing a friendship bracelet. We’re not best friends though. Today, we’ll take a look at how working alongside a video specialist actually results in a better end product. Here’s an example of some work we’ve done with our friends at the Amarillo Economic Development Corporation. For the past year, we’ve been just a call away from great video that’s turned a lot of heads. Not all that long ago the video landscape was largely populated and consumed by a younger demo – early adopters who would shoot, edit and post directly from their phones and simultaneously stream huge amounts of digital content, from music and entertainment to news and branded content. Nowadays, however, there is universal acceptance and demand for digital content across all demos. 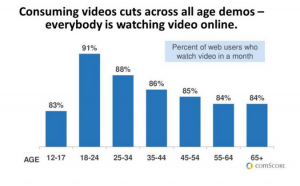 A recentcomScore report revealed that there is surprisingly little difference among age groups when it comes to consuming online video. In fact, as the chart below indicates, a higher percentage of the 65+ demo watches video in a month that the percentage of 12-17 demo. Simply put, whether you’re promoting youth football or sharing success stories, there is a built-in audience for your video content. But before you start live streaming your next board meeting, it’s important to understand that not all video is created equally. Every now and then there will be an authentic low-budget viral hit. Like the 37-year-old Texas mom who used her cell phone to recorded herself wearing the Star Wars Chewbacca mask she serendipitously bought for herself at Kohls. If you haven’t seen it and need a feel-good moment, check it out. According to Forbes, after the video went viral, the mask sold out of every online retail site. Thus is the power of tying a product to an authentic human experience. Sadly, we can’t just set up a dash cam recording and expect similar results. The video landscape is noisy and competitive. According to CMI’s 2016 Benchmarks, Budgets, and Trends research, 79% of B2B marketers and 82% of B2C marketers in North America are using some form of video content. To be heard in today’s video environment, it takes more than just a budget for high quality video. It requires the skill of a content team that understands both your marketing goal and the difficulties associated with various video content. A report from Ascend2 and its Research Partners compared the most successful marketing videos to their production complexity. 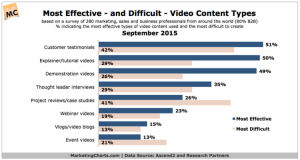 Customer testimonials, explainer videos and demonstration videos came out as the the most effective marketing videos, but also some of the more difficult to create. All that to say that if it’s worth doing, it’s worth doing right. It’s also worth finding the right team to partner with. Every piece of video content you create becomes a page in your brand’s story. You want to make sure that your story is told with integrity, passion and authenticity. Call it shameless, but the example is there. You won’t find a better way for us to tell you the Lemieux Story than through a video. That kind of brand storytelling doesn’t roll off an assembly line or get inserted into a generic template. That kind of storytelling happens when you spend time with a trusted professional hashing out what really sets your company apart and working together to tell it through the emotion of sight, sound and story. You noticed we used the word branding “process.” Any video content should be more than a one-off, stand-alone piece of production. If done right, every video can help ladder your audience to a better understanding of who you are and why consumers should engage with your business. The process phase of content creation is so important, that the Content Marketing Institute identified it as their top suggestion for getting the most value from your video investment. Invest in the process, not just the product. Here at Lemieux Company, we take that process as a serious trust. We want every client to be able to see their unique fingerprint on their branded video. That’s why we work one-on-one to help companies large and small craft a memorable, strategic video that will, in time, become part of the legacy of its creator. Ready to start telling your brand story? We’re all ears. Give us a call (806.502.8383) or shoot us an email (wilson@lemieux.company).